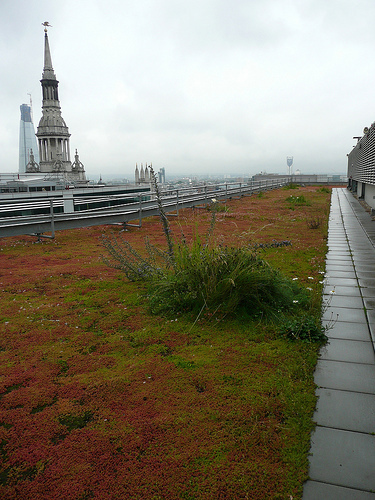 The Urban Wild Project was set up to green roofs of businesses in Herne Hill. Urban greening is essential to help London adapt to climate change. There is a growing recognition that green roofs are an effective way of improving the environment in which we live. A project on this scale can make a real difference to our local air quality, help combat rises in temperature, absorb storm water run off, reducing flooding in the area, and provide places for wildlife such as bees, butterflies and beetles to live, feed and nest. We have funding for the first stage and the project is gaining momentum all the time! We are planning to install approximately thirty green roofs on non-residential roofs in Herne Hill. These will be on the shops along Norwood, Croxted and Railton Roads. For full details please visit the Projects: Green Roofs page. • We have found a home for the tea plantation - thanks for all your suggestions. The wonderful Sydenham Garden, an award winning charity who provides horticultural opportunities for people coping with ill-health, are the proud new owners. Cuppa anyone?